Today is a first: I’m telling you about a web series, which I’m fairly sure has never happened before (on this blog, anyway — I’m pretty sure I’ve told you about stuff in person, but of course that doesn’t count because it didn’t happen on the internet). But Frank, as you are a man who appreciates transmedia narratives and Jane Austen (at least, I think you appreciate Jane Austen), you’ll be glad to know about this. There are more adaptations of Pride and Prejudice than there are stars in the sky, but The Lizzie Bennet Diaries, which premiered on YouTube last April, is the only one that updates the characters as young, Internet-savvy vloggers, and uses multiple social media accounts to offer multiple perspectives on the classic tale of gossip, misunderstandings, stubbornness and (eventually) makeouts. I have already written about Lizzie Bennet in a professional capacity — if you wanna know about the creators and the budget and their new fancy production deal, I got you covered. But Frank, while all the SRS BSNS stuff is good to know, the fact is that the series has become a joyful celebration of its source material, while also an independent narrative in its own right. Lizzie Bennet begins simply enough: A 24-year-old grad student named Lizzie vlogs with her best friend Charlotte about her crazy family — well, her crazy mother and younger sister Lydia, and her sweet older sister Jane. When a hot and wealthy new guy named Bing Lee (yep, he’s Asian) comes to visit their small central California town, life gets interesting for the Bennet sisters — though Lizzie can’t stand Bing’s best friend, the arrogant William Darcy, who has a habit of hovering in the corner fake-texting his way through parties. There’s really not a lot to tell you about the plot, Frank, because as you are an educated human being living in the Western world, you have at least some familiarity with it. The story’s unfolding relatively true to the original book, with some alterations — for example, last week’s episodes all revolved around the girls trying to go home for Thanksgiving, which was not a part of the original story, as I’m pretty sure Regency-era England had no idea Thanksgiving existed. Because five daughters is a bit much for the modern family, the Bennets are pared down to three sisters: Jane, Lizzie and Lydia. Mary is recast as their moody cousin. And Kitty Bennet? She’s Lydia’s GODDAMN CAT. Mr. Collins, rather than being after Lizzie for her hand in marriage, wants her to work for his new media production company — she declines, and Charlotte takes the job instead. I like this because making the Collins proposal career-oriented means the plot doesn’t entirely hinge on the romantic lives of the characters. Because in case you forgot, Frank, the lives of ladies are not totally tied to their vaginas. Again, Kitty is a goddamn cat. I love that very much. Kitty being Lydia’s cat is revealed in the companion series The Lydia Bennet Diaries, which tells the story from Lydia’s unique point of view, and promises to get more interesting as things develop. It is doubtful, in your traditional Austen adaptation, that Wickham would be reinterpreted as a swim coach frequently subjected to the female gaze. But Lizzie Bennet is far from traditional. Your typical P&P is also chock full of Darcy, start to finish. However, because the show is framed as Lizzie’s video diary, there was no clean narrative way to squeeze him into her bedroom — thus, the show actually didn’t get around to revealing him on screen until Episode 60. His more cad-ish moments were re-enacted by other characters wearing hats, because Lizzie Bennet Diaries has a deep affection for silly hats. But those looking for more insight into Darcy could check out his Twitter account, which began updating near the beginning of the show, and has followed along with story events well before his first on-screen appearance. In general, all the social media stuff goes a long way towards filling in narrative gaps that Austen could only get to by switching narrators. 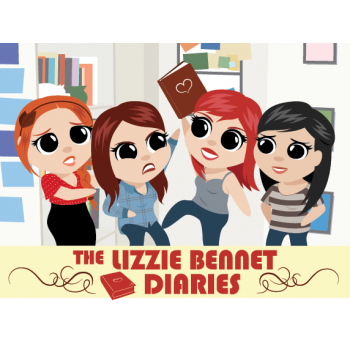 Pride and Prejudice is largely Lizzie’s story — but despite the name, Lizzie Bennet Diaries encompasses a much broader view of the world. Which is what I like about it, to be honest — by literally taking close to a year to tell the story of Pride and Prejudice, Lizzie Bennet has become one of the more thoughtful and developed adaptations I’ve ever seen — while also conscious, on a meta level, of its chosen format and the effect it has on the narrative. The cast is stellar, the writing great, and the result is a series that’s the highlight of my Mondays and Thursdays. So just load up the episode playlist, watch a few episodes and see how you like it. At the very least, you’ll enjoy discovering a new and exciting approach to storytelling — all thanks to the internet. Posted on November 28, 2012, in Some Spoilers, TV and tagged based on a book, girrrrrrrrl power, Jane Austen, pride and prejudice, the internet!, The Lizzie Bennet Diaries, YouTube. Bookmark the permalink. 3 Comments. where they’ve got provided a sample database spec for usage in a accommodation reservation application. been fixed since the interview with Russo happened, and usernames are again safe and secure.